"The truth will make you free, but falsehood always brings violence in its wake"
FRONT ROYAL, VA — Progressives disdain the past. They prefer to look to the future. They promise it will be better, if we but do what they tell us. That's why they call it "progress." They're in charge, and they're better than we are — right? Well, when things don't quite work out (and they never do), they tend to lie a lot, telling us to keep our confident eye on that ball bouncing progressively towards a better life. Take off their rose-colored glasses, however, and look: it's a wrecking ball. Karl Marx was the progressive paragon. Indignantly critical of everything in the past, he laid the groundwork for revolution as the roadmap to a perfect future — within history, not beyond it. Just what would that future look like? Don't ask. Marx insisted that there were certain questions a good socialist shouldn't ask — especially those that might expose the fallacies of Marxism. There are also apparently questions a good conservative shouldn't ask — especially those that might expose the boundless errors of progressivism. For instance, if you ask Hillary about Benghazi, she will slap a bumper sticker over her mouth that reads, "What difference, at this point, does it make?" She learned that from Bill. But it's curious, when we recall that this power couple grew up in the generation whose bumper sticker read, "Question Authority!" Once Hillary had any, however, the dialectic conveniently turned that upside-down: "Don't Question Authority!" Note: the present must always be terrible. Otherwise, we wouldn't need progressives to save us from it. So Obamacare's failure is actually a success. As the shards of Obamacare's collapse continue to inflict their death of a thousand cuts far and wide, forbidden questions abound. Any rational inquiry would indicate that the entire enterprise is a disaster. Yet, the hidden heart of the socialist believer beats with the pulse of Marx's candid assurance that the current historical transition to Truly Socialist Man would be more violent than any prior stage of the class struggle. After all, it's a Law of History. In brief, the Phoenix has to rise from the ashes. So the first order of business is to produce the ashes. Tear down the ancien regime. Burn it. Destroy it. Utterly. That's the price of "progress." One wonders, what is it that drives the Obamanite ever onward in the face of the colossal failure of his promised land? Oh sure, the Rubble has often described the nasty underside of the tyrant's psyche — the libido dominandi and superbia vitae — the sinful but powerful lusts for power, fame, and glory. But what unites the progressive left? Sure, there are a few budding Lenins out there, but what inspires the masses? How can they get out of bed every morning and trudge through the wreckage that their leaders have wrought, and still believe? Hope is a theological virtue. When Father Paul Scalia buried Judge Robert Bork, he said, "Bob was a hopeful man. Of course, he wasn't an optimist." It's an old story. In fact, forty years ago Gerhart Niemeyer wrote that "not only Communists but all other varieties of progressive have raised hope as the flag around which their supporters rally." "This 'principle of hope,' he continues, "centers wholly on the future, a future of expected political perfection." With keen foresight, Niemeyer limns the current progressive imagination by invoking Whittaker Chambers: "for Communists the present was terrible but always held out the prospect of hope." Note: the present must always be terrible. Otherwise, we wouldn't need progressives to save us from it. Caesar cannot love: he can only command. And obedience to Caesar is mandatory. So Obamacare's failure is actually a success. That's the dialectic at work, once more. Marxists do not have a monopoly on hope, Niemeyer explains. In fact, many Christian clergy long for a "politics of hope" they can call their own. They're jealous of the Left and its ability to promise a better world. Niemeyer goes so far as to brand this longing as "covetousness," because the true believers "have drawn their secular hopes not from Christian sources but from futurist ideologies." So they drink the progressive Kool-Aid and embrace Caesar and his empty promises. In Latin America, it's called Liberation Theology. In the North, they call it "Social Justice" — which is Marxism, says Francis Cardinal George of Chicago, if it is without charity. Charity, caritas, means love — which is by nature voluntary. But Caesar cannot love: he can only command. And obedience to Caesar is mandatory. Saint Paul's vision of hope is worlds away from Caesar's, Niemeyer writes. "Christian hope is for things imperishable, not confined to this world — things promised by God and secured by Jesus Christ. With a view to this imperishable glory, the entire Christian life is illumined and transfigured by hope. Hope thus is an enduring quality of a Christian life, together with faith and charity." Niemeyer helpfully identifies progressivism's false promise as "counterfeit hope." Its gravity tends towards idolatry: It confers on man the ability to achieve on earth what Christian hope promises beyond the eschaton. Meanwhile, the Incarnation never happened. Even if it did, "What difference, at this point, does it make?" Of course, hope is just one of the three Theological virtues. The progressive counterfeiter perverts faith and charity as well. Consider faith. What do we believe in? Ah, "Democracy" — with a secular faith so unwavering that we feel sanctioned, even compelled, to export democracy to an unreceptive world by force and violence. Our Drones of Love deliver the burning fire of equality. We will put an end to evil in the world. It's democracy's version of the New Evangelization. Consider charity. We are everywhere surrounded by what Louis Perroy in 1922 called "counterfeit charity." Ironically, that was when the U.S. Catholic Church, led by Baltimore's James Cardinal Gibbons, became a partner of the federal government. Together they have cheered the New Deal, the Great Society, and now, "Health Care for All." So "Social Justice" has replaced charity. The result? The Church that built hospitals, cathedrals, schools, soup kitchens, orphanages, and universities with no government funding in the nineteenth-century can't seem to survive without it in the twenty-first. Thus the Church today preaches the perplexing oxymoron of "mandatory charity": the bishops constantly demand more spending on federal welfare programs, and then they receive several billion dollars in government contracts per year. Taxpayers now fund "government charity" — whether they like it or not. Meanwhile, back in the pews: "Today's collection will fund our lobbyists in Washington." Perhaps this is the price of progress. 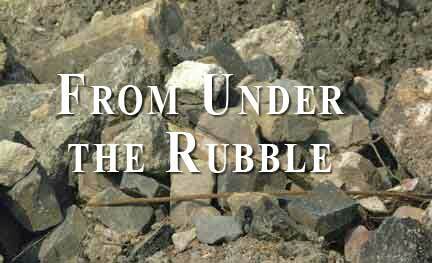 But the Rubble, while hopeful, is not optimistic.